BluWave CRM Software involves using software to radically streamline all phases of the sales process, minimizing the time that sales staff require to spend on each phase. You can greatly increase the productivity of sales reps - and even do more with less sales staff using the BluWave sales software. 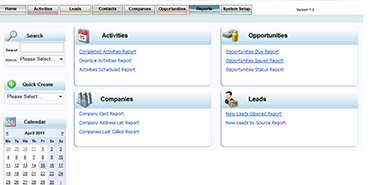 The sales software uses a pipeline to track at what stage the opportunity is in the sales process. This is useful to forecast incoming sales revenue. The BluWave CRM Software system revolves around a contact management component linked with a diary for scheduling appointments and things to do. 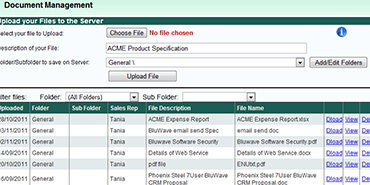 BluWave CRM Software has the most compressive suite of CRM Software features for the price you pay. BluWave CRM Software allows via the cloud for companies to create and track specific web activities that help develop the Customer relationship. These activities include such activities as tracking email conversations by customer, do web based email marketing promotions and automatic import of CRM Software leads from the Internet straight into the Application. The results of applying CRM Software Tools are increased sales and reduced costs. A Harvard Business Review article cited increases in sales of typically 35% and cost reductions of 25% - adding a hefty profit to the bottom line. Customer Loyalty becomes entrenched resulting in a reduced cost of sales. 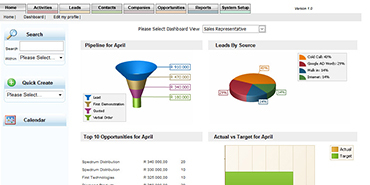 Your Performance Dashboard represents your sales environment visually, with easy to read charts and tables. Recent opportunities, activities, contacts and companies are all displayed. A graphical "funnel" represents your sales pipeline. 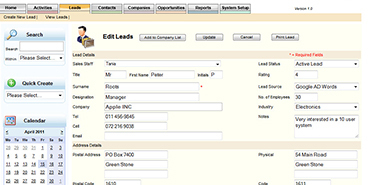 New leads flowing into the system are also visible. 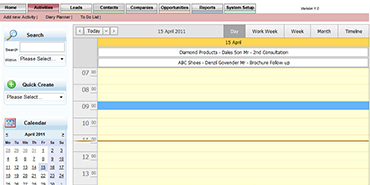 BluWave CRM integrates with Outlook and most web-based email and calendaring software (e.g. Gmail). 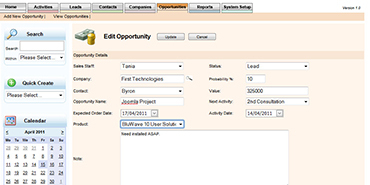 When an appointment is created in BluWave CRM, a corresponding appointment is created in your default emailing program and a meeting request is generated and sent to the invitee. All this is achieved in one simple, efficient process. Use the Opportunity Tracking functions to manage new business acquisitions. Track the progress of your sales by defining your own sales process. Enjoy the convenience of new business forecasts, generated by the system based on expected order dates and sales probability percentages. 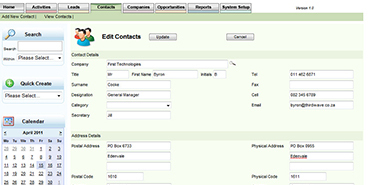 Store any number of contact people per customer. Allocate your customers to your branches, as well as specific sales staff within your branches. This database stores all NEW enquiries. They can be imported from lists or directly from your website. Once actioned and qualified they can be transferred easily to the company's database for further processing. Automatic Push Reports are dynamic and proactive. 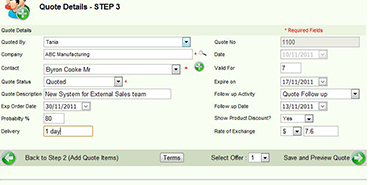 Configure the system to send you regular sales progress stats. Users can see their own stats and management are able to receive performance stats on their whole team. Document Management stores all the marketing documentation that your sales team requires; brochures, specifications, pictures, etc. Upload your marketing material onto the BluWave CRM server for your sales team to forward to customers using the Email function of BluWave CRM, or by attaching them to quotations prepared in BluWave CRM. With BluWave’s customer conversation tracking software, you can keep accurate track of all email and telephone conversations you have with your prospects so you can pick up exactly where you left off each time you speak to them. 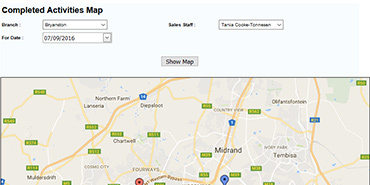 BluWave CRM automatically geocodes (adds latitude and longitude) to each customer as the physical address is entered. This will allow you to draw up a report of that reflects the location of all completed face to face actives. Sales reps can also draw travel claim reports making it easier for them to claim back travel expenses at the end of the month.